Nothing has been the same for Mackenzie after the death of her best friend, Amy. After deciding to find Amy’s killer herself, Mac discovers that the town she lives in, and the people she knows, are not exactly what she believes them to be. Secrets are discovered and lives are put on the line, all in the search for the truth. I found Mac to be a very likeable character. She’s definitely not one to sit around and wait, but she jumps in head first and not always into good situations. She’s very insecure and self conscious, and that makes her very relatable. She’s been abandoned over and over again by the people that she loves, and that makes it hard for her to trust people. Especially her friends and what’s left of her family. Mac is very flawed, and because of that, I found her to be a great heroine. While there was a bit of a love triangle in the book, it was extremely well written. I chose my side pretty early on in the book, but I have to say that I loved both Kyle and Jason, and each for very different reasons. Kyle had all of the characteristics that I love for a male protagonist, but Jason was a tortured soul that gets me every time. It was very hard to choose between these two captivating young men. The storyline for the book was very engrossing. I figured that once you had read one werewolf book, you’ve pretty much read them all. I was wrong. The story was fresh and unique in its own way, and it managed to grab my attention and hold it through the book. The pacing was just right for the story, never boring, but never too fast paced as well. It was just right. Overall, I really loved this book, so much more than I expected to. Hemlock was an intriguing read that kept me turning the pages. I can’t wait to get my hands on the next book, to see what adventures Mac, Kyle and Jason will take us on next. This looks like it's really good...I can't wait to read it! I have this on my shelf, so I need to read it because it sounds really good! I'm really looking forward to reading this one. I love flawed characters and I'm glad to hear you thought the story was fresh. 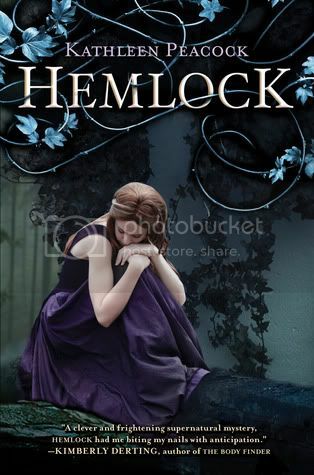 I can't wait to read Hemlock! The premise sounds so interesting, and your review just made me want to get it even more! Great review! sounds like a great book. I'm glad the werewolf storyline is unique!! I think I might have to read this one. Ordinarily I do not like love triangles but early reviews have made me kind of excited about this one. I am very curious to find out which team I'll support! This book ticks all the boxes! A narrator we can relate to, a well-written romance and a unique story! Cannot wait to read this :D Great review! I agree that the love triangle was well-written (it's just the bad or annoying ones that I can't stand!) and I loved both Kyle and Jason even though I made a choice rather early on as well. Great review!